Packed with new features, the updated English Language Arts program includes a student interface where teachers can assign independent work. Wonders 2017, the newest version of McGraw-Hill’s K–6 English Language Arts program, is packed with new features and resources. 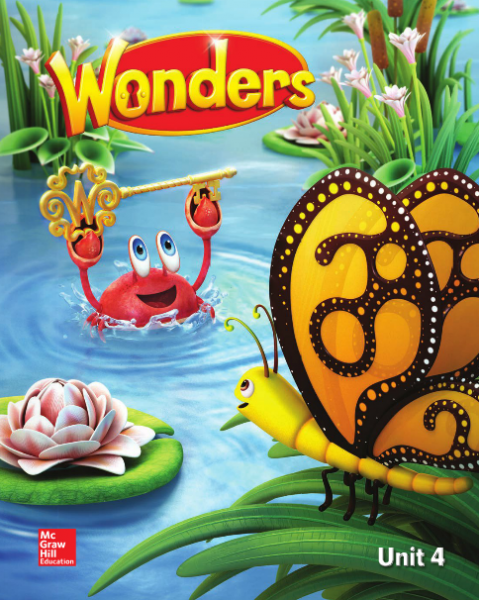 It is released along with Wonders for English Language Learners and Maravillas, which is in Spanish and English; both mirror the Wonders curriculum. Wonder 2017’s digital curriculum is the focus of this review, but it also includes full print resources for teachers and students, accommodating a wide range of districts and their schools, in various stages of tech adoption. 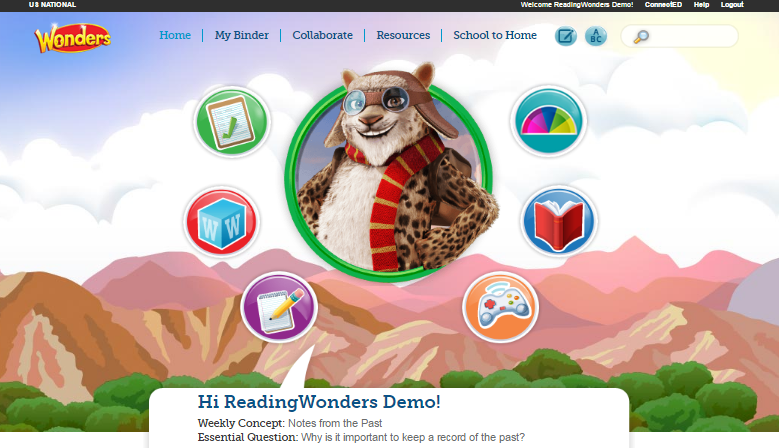 The Wonders core ELA program consists of a suite of literacy materials including trade texts at all K–6 levels; a teacher interface that houses materials and lesson plans for whole group and small group instruction, plus professional development resources; and a student interface where teachers can assign independent work. Wonders 2017 can be implemented in its entirety using only the digital suite of resources. The teacher interface hosts the bulk of materials. Teachers can interact with and adjust their schedule using a digital planner, set up at the beginning of the year to follow their school’s unique calendar. A new 2017 option is to see only “core” lessons on the planner, simplifying the view. A presentation tool created slideshow presentations, drawing from daily lessons that have been scheduled in the planner. Depending on the day’s activities, the slideshow might include an ebook version of a model text, an image of a handout or graphic organizer accompanying the lesson, or a video. If a plan changes in the scheduler, the presenter updates accordingly. The teacher interface includes a sizable library of support resources, ranging from videos of sample lessons to a 24/7 chat box connecting fellow teachers. A collection of all student handouts and support for targeted interventions is available in the professional development area. The big new addition to the teacher materials is the Data Dashboard, which records and organizes student assessment data and links it to the skills and standards that aren't being achieved/met. Teachers can use the dashboard to get a snapshot of how the whole class is doing, or drill down to individual student results. The data is comprised of individual student work, which they complete and submit from their own logins; formal assessments; and even information on their progress on included games. 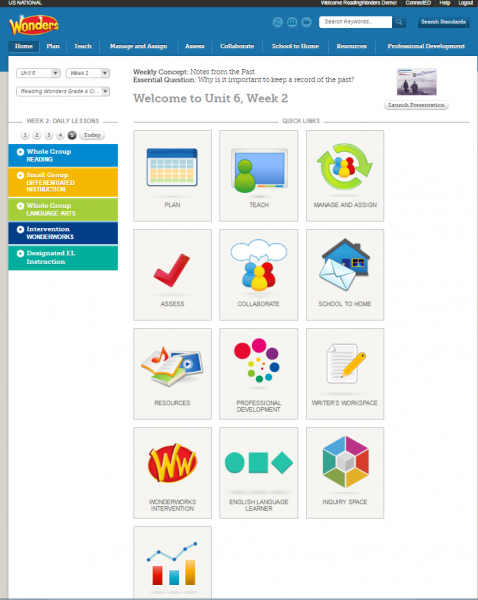 Administrators may also view this material on their own dashboards. Students can also access independent work via their logins. 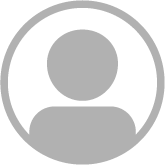 Teachers set them up with a traditional username/password login or a simple picture login for young children. Within their individual accounts, students may read leveled texts, complete assignments that correspond with their texts, and practice with literacy-based games. Some assignments may call for students to collaborate and place their recorded discussion in a graphic organizer, or perhaps record themselves reading an assigned story and submit the recording to the teacher. For parents, a description of every book is available in multiple languages. The student interface is also where students in grades 3–6 will enter the new Inquiry Space, which houses three progressive tasks engaging students in guided research, source evaluation, writing, and presentation skills. These projects are designed to foster creative and critical thinking. The Wonders 2017 package is impressive and comprehensive. With the involvement of educational leaders such as Douglas Fisher, coauthor of the Fisher & Frey series of literacy and instruction materials, Wonders is built on a foundation of current instructional best practices and understandings. The creators have taken purposeful strides toward informing and involving parents in their children’s literacy education by creating weekly parent letters in 10 languages, including Tagalog and Korean. Like the Everyday Mathematics curriculum, also from McGraw-Hill, Wonders spirals to return to skills again and again with growing rigor, and it integrates games that challenge and engage students. However, mastering the digital version of the package could be a hurdle to some. While the teacher professional materials include several tutorials on how to use the different tools, one must navigate the digital interface to access them. Also, while the student interface offers many options, it seems best suited to buildings with one-to-one access to devices. Finally, Wonders 2017 offers little wiggle room for creative teaching or external units and isn’t designed for a reader’s workshop model. Another option, however, is the Wonders Balanced Literacy pathway, for districts following a workshop format. That product blends Wonders instruction and digital resources with more flexibility for master teachers. Still, Wonders 2017 is a good fit for schools looking for ways to streamline their ELA curriculum and is especially suitable for novice teachers or those new to literacy instruction. The all-digital package leverages one-to-one devices well, and the built-in data collection will make administrators happy. It’s a literacy curriculum designed for tech-savvy, fast-paced schools. Is SLJ financially connected to McGraw Hill? Since we don't purchase textbooks for the library, I don't see the justification for this review. Thanks for the feedback, Jennifer. A curriculum, rather than a textbook, Wonders and its updated features warranted a closer look in this detailed review, as determined by our editors. Our reviews encompass technology, software and hardware, apps, web-based products, and more, and can be found here: http://www.slj.com/category/reviews/tech/. We look forward to covering augmented reality and virtual reality content as it develops.